Mexican rivers are not well suited for navigation and thus have had only a minor influence on Mexico’s historical development. Their most important use has been as sources of irrigation water and hydroelectric power. Mexico’s annual flow of river water (roughly 410 km3) is about 25% more than the St. Lawrence River, but 25% less than the Mississippi River. Most of this flow is in southern Mexico which gets by far the most rainfall. Mexico’s dams have an installed capacity of about 11 gigawatts of electricity, roughly one fifth of the country’s total generating capacity; they don’t operate at full capacity, so they only generate about one eighth of total electricity. Only about a fifth of the total river water is consumed for other productive purposes. This proportion is far higher for rivers in drier northern Mexico where river flow is significantly smaller during the dry winter months. The two longest rivers in Mexico, the Rio Bravo (Rio Grande north of the border) and Colorado, start in the US state of Colorado (see map). The Río Bravo is about 3000 km (1900 mi) long and forms the border between Mexico and the USA for about 2000 km (1250 mi). Occasionally floods shift its location resulting in border disputes. Though it drains about a quarter of Mexico’s total area, its drainage basin is arid and its total flow is less than 2% of Mexico’s total. The Colorado River, which is almost entirely in the USA, formed a vast delta in the otherwise arid Sonoran desert in northern Mexico. The amount of water reaching Mexico has declined dramatically as a result of the Hoover and Glen Canyon dams and other diversions in the USA (see here, here and here). As a result delta wetlands have been reduced to about 5% of their original extent, and the potential water supply for the rapidly-growing urban centers of Mexicali, Tijuana, Tecate and Rosarito has been compromised. 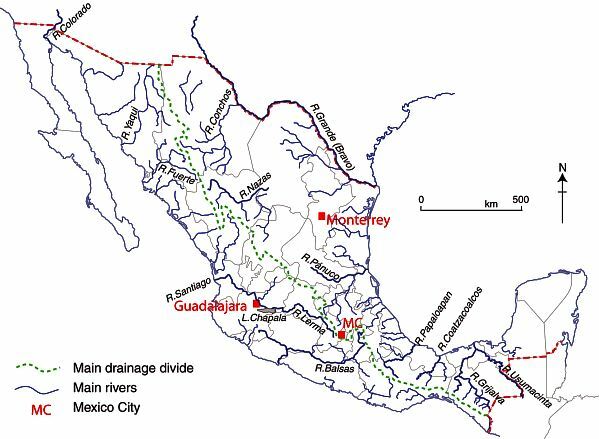 Interestingly, the Mexican river with the greatest flow, the Grijalva–Usumacinta, does not start in Mexico either (see map). The river has a double name because it is actually a double river, with two branches of similar length which both start in Guatemala. Each branch flows about 750 km (465 mi) through Chiapas before they unite in Tabasco about 25 km from the Gulf of Mexico. Each of the two branches has a flow of about 14% of Mexico’s total. The flow of the combined Grijalva–Usumacinta River is about twice that of the Missouri River in the USA. There are several other important Mexican rivers. The Lerma River starts in the State of Mexico and flows westward into Lake Chapala and continues to the Pacific Ocean with the name Santiago. The Lerma–Santiago River system is about 1280 km (800 mi) long, the longest river entirely in Mexico. It drains about 6% of Mexico. The Lerma–Santiago, which flows through several states, is one of the economically most important rivers in Mexico because it feeds some of the country’s prime agricultural areas as well as the two largest metropolitan areas: Mexico City and Guadalajara. However, its flow is quite small, only about 2% of the national total. The flow of the Balsas River, south of the Lerma–Santiago, is about three times that of the Lerma–Santiago. Though it offers some white-water rafting and irrigation opportunities, it is not as important economically. There are numerous rather long rivers that also flow west to the Pacific from the Western Sierra Madre in northwestern Mexico, but these have relatively little water. There are also several rather long rivers in the north such as the Nazas that flow into landlocked basins and either die or feed small drying lakes. Three major rivers flow into the Gulf of Mexico through the state of Veracruz. The Rivers Papaloapan and Coatzacoalcos start in Oaxaca and flow through southern Veracruz. Their combined flow is nearly 20% of the national total. The Pánuco–Tamesi–Moctezuma River system starts in the State of Mexico and carries nearly 5% to the Gulf of Mexico at Tampico. Do you think the lack of navigable rivers contributed to the centralization of the country? This is a truly great question! Thanks for asking it. My view (in short) is “no”, but there are lots of things to bear in mind when considering this. It also may depend on whether you view “centralization” only in terms of population distribution, or also in terms of economic activity and/or political/administrative structures. I think the legacy of the Aztecs lives on, given that Mexico City was built on top of the Aztec capital Tenochtitlan. Centralization was enhanced by Spanish colonial authorities who (as in the case of almost all colonial powers) wanted control and decided this was easier to achieve via a centralized (bureaucratic) system etc. Now that you’ve given us the incentive, look for a future blog post or two looking at your question and various other aspects of centralization!